Second to the iPhone 2.0 announcement (and maybe the Yahoo-Google deal), what was the most important event of last week? The start of Euro 2008 tournament of course! So if you’re going to soft-launch a football oriented social network like Footbo.com, this is the month to do it (the tournament runs throughout June). 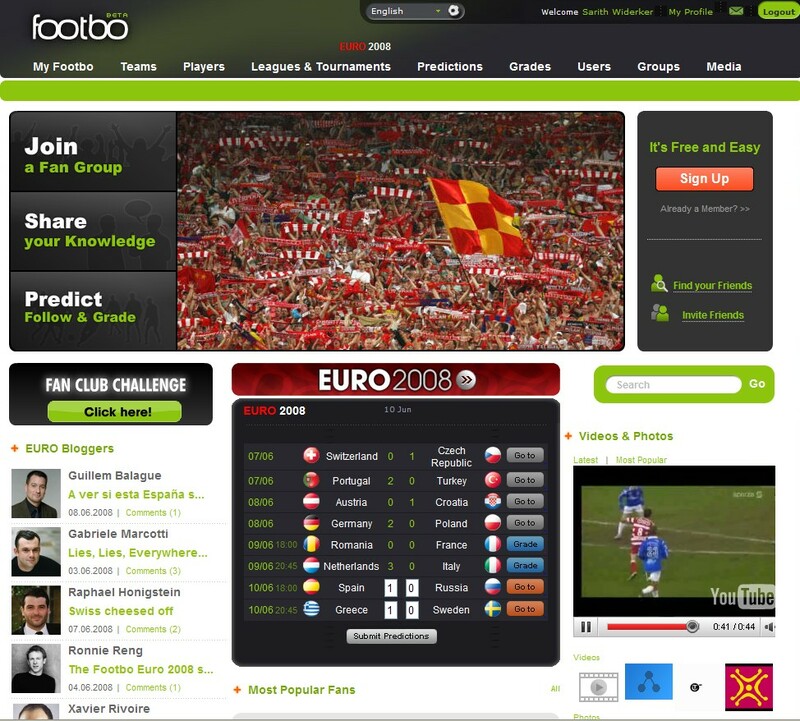 Footbo is the type of niche-oriented social network we have grown accustomed to. From a feature perspective there’s no attempt to reinvent the social network experience—in fact, the current interface doesn’t offer any Ajax/DHTML/CSS pizzazz. The idea of “less is more” rings true in Footbo’s case, which focuses on offering an information and interaction hub for everyday football fans, as opposed to cutting-edge functionality and interface design. Even so, the design is at times rough around the edges with tables running amuck and such. 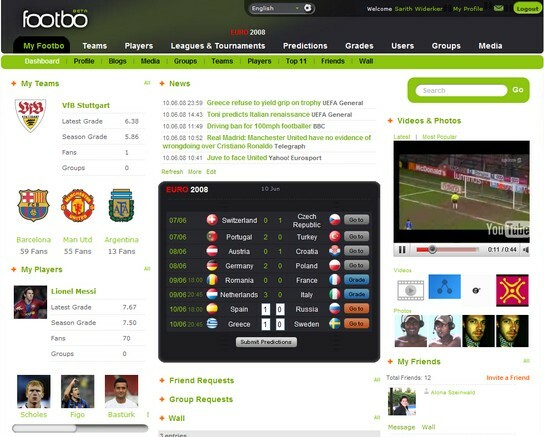 Footbo provides football-related content in the form of live feeds, line-ups, game schedules and tables from about 70 leagues around the world. A Predictions section allows users to predict the final scores of games. These can be submitted/edited until the kick-off of each match. Users can also grade player performance, thereby electing the “Top 11” of each league or round. Integrated wiki functionality lets users add and edit content about teams and players. There are already tens of thousands of existing profiles with basic info on teams and players. Game pages feature fan boards and live discussions. The Euro 2008 section leverages these features on a single page for a “one-stop” experience. Footbo is predominantly a European play targeting individual fans, fan clubs, and amateur teams. For the sake of context, Footbo estimates there are 170,000 amateur football teams in Germany alone. Properly executed, there could be plenty of business servicing this niche alone. However, Footbo’s scope is wider as is evident by the fact that the site is available in English, German and Spanish. Footbo will launch its official Beta in August with a host of new features. It’s up against some serious competition from ESPN’s Soccernet and less serious competition from Joga.com (a soccer social network that was created as a joint venture between Nike and Google’s Orkut which is now seemingly defunct—all that is on the site is a splash page promising that something called JogaTV will be “coming soon”). North American readers: You can now revert back to the term “Football” referring to a game with far too many rules played with an egg-shaped ball.